This morning’s DC Comics breakfast promoting Tom King’s Heroes in Crisis was quite different from the standard press junkets. Press were greeted to the ‘Sanctuary’ in a unique fashion – literally – we were given white DC-branded robes to wear and an extremely healthy spa-like breakfast on the Hornblower Yacht at San Diego Comic-Con. The entire atmosphere was relaxing with fruits and oatmeal and soothing music played throughout the session with an occasional gong. As press began to gather among a seat of pillows on the floor, King was placed front and center on a platform like a meditation coach prepping for zen-like chants. The purpose of this experience was to explain the purpose of Heroes in Crisis. Although superheroes are physically strong, their mental state aren’t always. 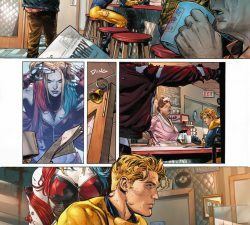 In King’s Heroes in Crisis, he explores the concept of mental health. Where do the heroes go to heal their minds? This is where the Sanctuary comes in. Created by Bruce Wayne with Kryptonian technology in rural Nebraska, the Sanctuary is a place for superheroes to anonymously come to confront their pain and process it before returning to their superhero activities. Heroes are given masks for anonymity and, in the end, confess their deepest darkest secrets and fears to be able to move on. The crisis isn’t about the world ending, but the mental crisis they would face if they didn’t confront their mental state. King, a war veteran, experienced his own mental health crisis years ago and began to think about how superheroes would react to their own crisis. King introduce his artists for the series, Clay Mann and Mitch Gerads, who sat beside him throughout the session. Mann will do the main art for the books, but as the story becomes more emotionally intense (like all of King’s books), Gerads will work on the ‘deep dives’ throughout the series. 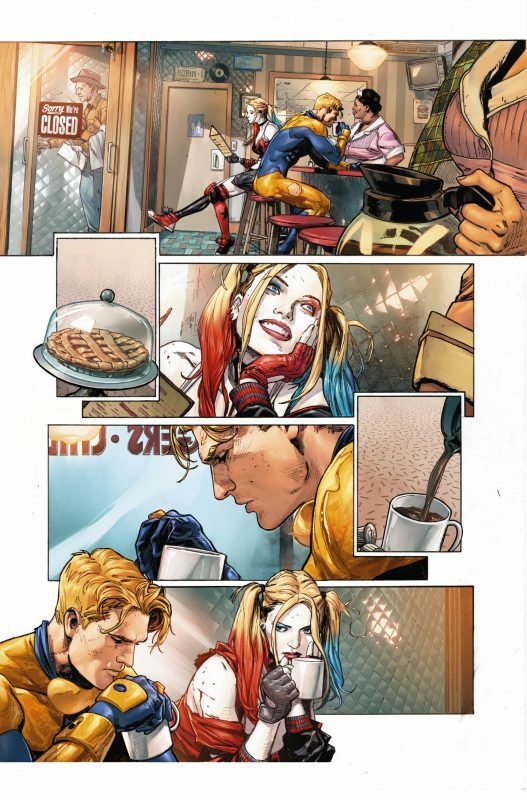 The artwork revealed showcased different emotional moments of Harley Quinn and Booster Gold. In these confessionals, the superheros are able to let go and confess how they’re feeling. Of course, this series isn’t all about healing and the Sanctuary. The comic begins with a massacre at the Sanctuary. 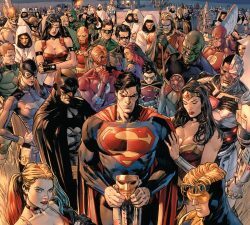 With dozens of heroes killed, DC’s Trinity – Batman, Superman, and Wonder Woman – try to find out who did this and why. 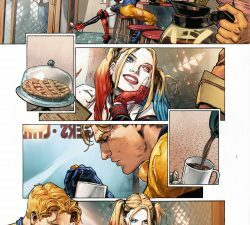 The two prime suspects seem to be Harley Quinn and Booster Gold. King consulted with DC co-publisher Dan DiDio on which two characters he could play with and evolve in this story. 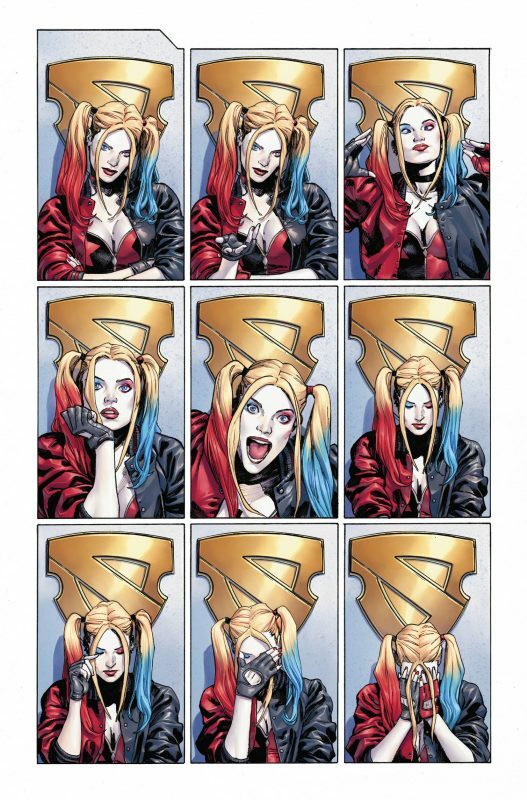 DiDio chose Quinn and Gold. 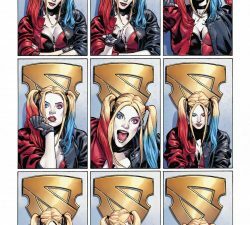 King explained the teaser image he posted on social media before Comic-Con and revealed it’s Harley Quinn holding the Lasso of Truth. He wouldn’t reveal the reason or how she got it, but did tell Nerd Reactor that it will be shown in the second issue. With the current political atmosphere and events, King wanted the comics to reflect the feeling of frustration but also of hope. He remembered working in Afghanistan for the CIA and reading Infinite Crisis and always remembered a line that DiDio said, “You can’t have a Crisis without a dead Flash. And that’s all I’m gonna say about that.” Take what you want with this comment. As for the mental health in the series, King did do some research and consulted crisis centers and psychologists on the topic, but really created the story based on his own experience. 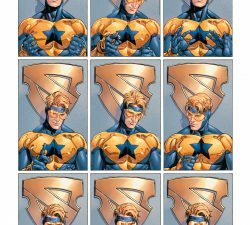 Heroes in Crisis #1 releases on September 26th.